What else do you on a rainy Boxing Day afternoon than get stuck into some fine Barossa wine? Christmas was a boozy affair here at Graham HQ, with my drinking highlight Primo Estate’s 2013 Joseph Sparkling Red. Each year it seems that I open a bottle of Joseph, each year I remind myself that we don’t drink enough sparkling red. Delicious. But back to the task at hand – Barossa! With this lineup I raided the sample pile and pulled out anything suitable. Anything. Interesting to note, again, how smart the Grenache based reds were in this lineup. Grenache is on the up baby, either in the Barossa or in McLaren Vale. Sourced from a vineyard near Stockwell in the northern Barossa. A left field surprise it is too. Green straw coloured, this fresh and apparently unwooded white has lovely lemon citrus fruit over a generous and surprisingly intense palate. Seriously lemony, this is much more than some generic white wine, the acidity real biting but not unnatural with some leesy overtones. This is lovely stuff! Genuinely refreshing lemony white. Best drinking: 2015-2017. 17.7/20, 92/100. 11.5%, $22. Would I buy it? I’d drink two glasses easy. Thiele Road is a dusty track that crosses the Bethany Creek and is home to the Schwarz family vineyard, with 70yr old Grenache vines the source for this wine. Wild fermented with 15% whole bunches, it was basket pressed and matured in old oak for 18 months, then bottled unfiltered. Just 300 cases produced, which means you’ll need to get in quick. Dark ruby red, it smells wonderful – real vibrant Barossa Grenachey. Earth, red fruit and some fleshy fruit, the palate combines the faint licorice spice of bunchy Grenache with a full generosity that is admirable. Minimal oak, fine tannins and a medium finish, the lick of warmth the only distraction. This is really good Grenache. Best drinking: 2015-2025. 18/20, 93/100. 14%, $38. Would I buy it? Sure would. 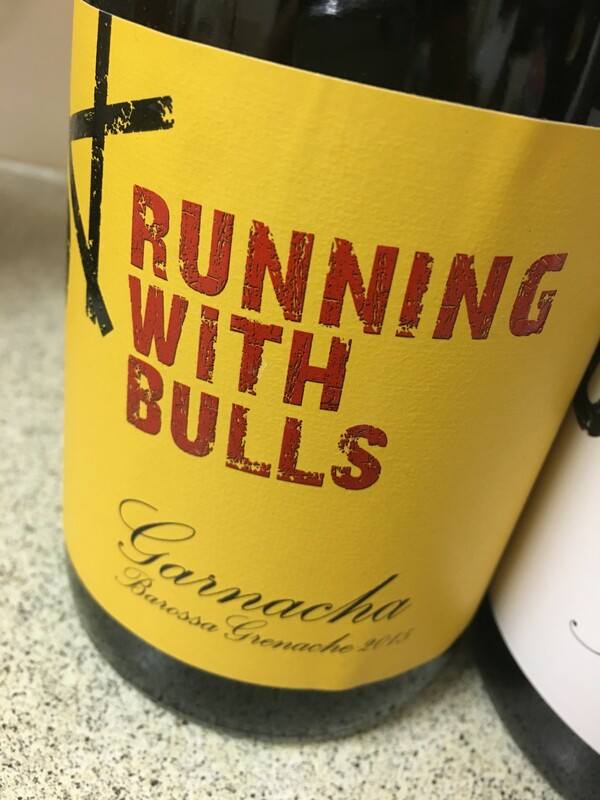 Clever bit of work by the Running With Bulls crew to call this a Garnacha. A Monastrell next? Surely. Anyway, this is a blend from all over the northern Barossa, predominantly bush vines. A joven style and cofermented with 4% Tempranillo, this include some whole bunches and was wild fermented. Excellent work all round. Numbers – pH 3.62, TA 5.3g/L. Bright ruby red, this smells of cherry, raspberry and earth, in the quintessential joven style. Whole bunch spice punctuates the light, bright, faintly spirits palate and the kirsch and sour meatiness is so welcome. A deliberately simple wine and very well made. Applaudable! It’s even surprisingly long. Extra points for style, this is also mighty impressive value for money. Best drinking: 2015-2020. 17.7/20, 92/100. 13.5%, $23. Would I buy it? I’d drink a bottle on a wine list, maybe two bottles. It’s smashable. Note that Grant calls it Mourvèdre – an outlier in the Barossa! Blood red with lighter edges, this looks and smells somewhat advanced for a ’12, the meaty, red earthy, licoricey nose very much driven by Grenache, ditto the span of red fruits on the palate. Easy to write this off methinks, but there is something quite appealing about the red fruits and slightly chewy style here – it feels very classic. I don’t mind this at all, bar the faint alcohol burn. Long too. Best drinking: 2015-2022. 17.7/20, 92/100. 14%, $42.99. Would I buy it? A two glass proposition. Sourced from multiple growers in the western ranges, across the Valley floor and over into Penrice. Wild ferment and matured in a mix of old and new barrels. Great to see technical numbers on the info label – pH 3.78, TA 5.3g/L. Medium purple red, this has the berries and earth of Tempranillo, if still quite ferrous and warm in its drive. Every bit the warm year wine, it’s slightly candied on the finish and just a bit thin. Not the greatest year for this wine, if still drinkable and varietal. Best drinking: 2015-2020. 16.8/20, 89/100. 13.5%, $23. Would I buy it? Not quite. From the Nitschke Block planted in 1968. Wild yeast fermented also with whole bunches and basket pressing with no filtering. Still think ’13 was a better Grenache year, which is why this is a step behind the equivalent Grenache. Dark plum red with purple edges, the whole bunches giving this a real stem kick, the palate rich and full but just a little baked plum edge. Soft and glacé fruited, the ’13 vintage giving this volume but not quite the grace. Best drinking: 2015-2025. 17.5/20, 91/100. 14.3%, $38. Would I buy it? Just a glass. I like the Grant Burge proprietary bottle – It’s like CndP! Deep red with a dash of purple, this has an old school, plum and mint Eden Valley Shiraz nose, complete with licorice and a little stewed fruit. Bold and open, it’s a quite quintessential Barossan red, all soft generous fruit and a lick of acid to keep things taut. Just a little stewed through the middle, but I like the Eden Valleyness here, even if it’s a bit tart. The longer you leave this, the more tart and obvious it looks. Length is very good though, hence a respectable score. Best drinking: 2015-2028. 17.5/20, 91/100. 14%, $42.99. Would I buy it? Not quite. From the Torzi Matthews vineyard high up on Mt McKenzie (which is basically the Eden Valley). Purple maroon red, the nose is a huge basket of red and black berries with just a little warmth. The palate, too, packs an awful lot of blackberry jam fruit with a dash of kirsch liqueur to finish. A real fruit bomb, it’s incredibly juicy if just a little too warm and jammy to be truly delicious. Nice wine for $20 though. Best drinking: 2015-2021. 17/20, 90/100. 14.5%, $20. Would I buy it? Just a glass. From a patchwork of vineyards around the Barossa. 14 months in a mix of oak styles and sizes – everything from octaves to hogsheads. The fermentation kicks off wild, completed with cultured yeasts (which is pretty standard really. Numbers: TA 6.3g/L. pH 3.6. Maroon red with purple edges, this smells of vanilla and red plum, an oak framed style of quite laid back Barossa Shiraz without fruit excess. Indeed it’s quite medium, in an appraochable, if slightly oaky style. Easy recommendation here – unpretentious and well balanced. Best drinking: 2015-2021. 17/20, 90/100. 13.5%, $22. Would I buy it? No, but I’d recommend it. From the century old Filsell vineyard in the southern Barossa. Deep, dark red it smells of chocolate and molasses the chocolate Bounty of American oak omnipresent in every nook and cranny, including through the finish. It’s a solid and hearty wine with lots of flavour, but gee it’s heard to see beyond the oak. Time will be kind, but not an easy drink now (unless you love sweet heavy toast oak). Plus signs really important. Best drinking: 2018-2028. 16.8/20, 89/100. 14%, $42.99. Would I buy it? No. Handpicked and open fermented, this spent 2 years in French and German hogsheads. Looks it too, the dark maroon coloured wine heavy with coffee, red earth and roast beef, the long barrel ageing giving this a rather forward nose. Palate is more about oak than anything else, coffeed, grainy oak, finished with bitter oak tannins. Overoaked, even after the Filsell. Best drinking: 2017-2025. 16/20, 87/100. 14%, $70. Would I buy it? No. From the Barossa and Eden Valleys, off mature vines with yields between 2-5t/ha. Matured for 12 months in a mix of oak barrel sizes and shapes and stuff, 12% new. Numbers: TA 6.5g/L, pH 3.6. 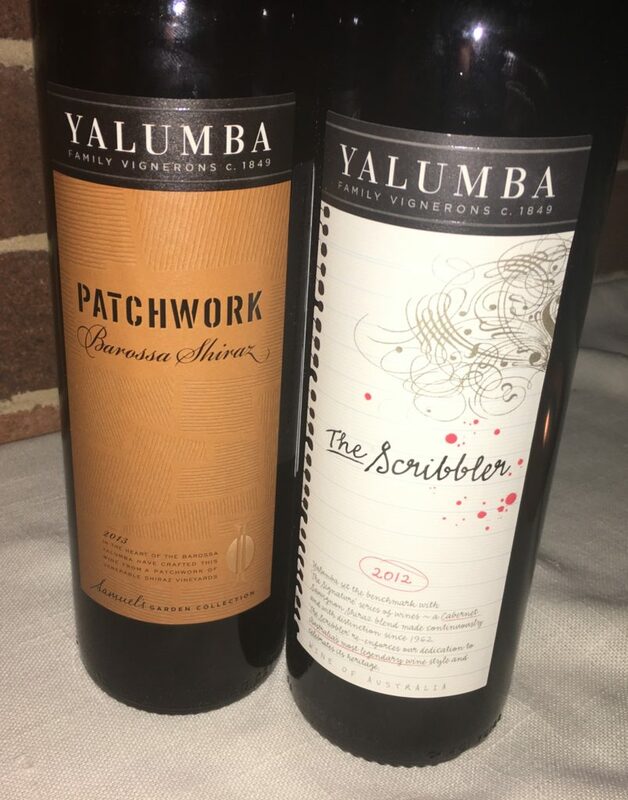 Medium red, the nose is oak framed and Barossan – it feels quintessential Yalumba red and baby Signature-esque. The only awkwardness lies in the oak tannins and slightly raised acidity. Length, however, is exceptionally good for this price point and the final result is a smart, structured wine for $24. Every mouthful reveals the structural depth too. Best drinking: 2016-2022. 17.5/20, 91/100. 13.5%, $24. Would I buy it? Probably not, would recommend it though. Corryton Park is fhe fabulous sprawling property that Grant owns near Mt McKenzie on the edge of the Barossa. It always produces definitively varietal Cabernet, and this ’12 is spot on the mark. Mid red, the nose is more cooler climes than many Barossa Cabs, with spearmint, eucalypt and a dash of cocoa, the palate noticeably pointy with plenty of acidity and no shortage of lingering tannins. It’s just a little bit awkward acidity wise, but the structure and balance here is applaud able. You’ve gotta like mint though. Coonawarra it’s not, but this has a place. Best drinking: 2018-2030. 17.7/20, 92/100. 14%, $42.99. Would I buy it? No, but I’d happily drink it in a decade.